WBPU Black Power 96.3 FM Radio is participating in #GivingTuesday - November 29 - when people give to the causes they care about. 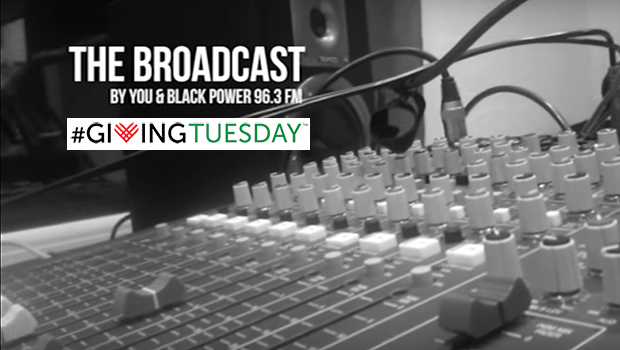 Black Power 96 Radio has a goal to raise $5,000 on #GivingTuesday to finish building the broadcast tower and to purchase additional equipment to get on air. Black Power 96 Radio is the latest project of the African People's Education and Defense Fund, an organization created in 1994 to defend the human and civil rights of the African community, to address the grave disparities in education, health and economic development and to build self-reliance and self-determination in the black community. 70% of African families on the city’s south side live below the poverty level. Half of all households living in poverty do not have internet in the home. These families depend on FM radio for news, information and culture. Black business districts were destroyed by the construction of I-275 and the Tropicana Dome and black entrepreneurs continue to face discrimination in financing and opportunities. Unemployment on the city’s south side reaches 15.8 percent, more than three times the national rate. The Tampa Bay Times’ recent investigative series called Pinellas County Schools “Failure Factories” that unfairly suspend black students at hugely disproportionate rates, failing 95% of African students in the subjects of reading and math. Black families bore the brunt of the sub-prime mortgage scams and continue to suffer massive displacement. WBPU - Black Power 96.3 FM is a community supported non-commercial radio station that exercises self-determination on the airwaves through black community control of our own media. The station will provide training for south St. Pete’s African community in professional radio broadcasting, developing audio engineers, administrators, musicians, DJs and talk show hosts. WBPU also supports economic development in the African community by providing businesses with affordable access to the radio airwaves. The station is very close to being able to go live on the air. Generous donors have helped fund the purchase of most of the needed equipment and studio soundproofing. Additional donations are needed to help finish building the broadcast tower to get on air and purchase additional equipment for professional livestreaming from the studio. Black Power 96 Radio calls on everyone who supports independent black community media and economic development, so important in these critical times, to give generously on #GivingTuesday. Your donation is tax-deductible. Donate and help spread the word! Visit blackpower96.org/donate. Together we’re building the baddest radio station on the planet! Not just explaining the world, but changing the world!